This has got me steaming. I’ve talked about it for a few years and I’m very passionate about it. A recent example made me do this post. I’m sorry about it being rather long. How is it possible that something as technologically advanced as a laptop PC or MP3-player fails completely after a year or two through something as technologically “dumb” as a barrel power connector or audio jackplug? This doesn’t just happen to the cheap Chinese crap that you find everywhere. This happens to brand-name products from the likes of Sony and Apple as well. I open up a lot of products, both to fix them and for educational purposes. Because I have a special interest in electronics, most of them are consumer electronics like mobile phones, MP3-players or laptops. Most of them come to me because they have been declared “broken” by their owner. Most of them still work fine. Only the connector that charges the gizmo (or some other important connector) is broken. Either, 80-90% of all consumer electronics on the market today are designed by Electrical Engineers and Industrial Designers who are “mechanically challenged” or this is done on purpose. I’m not big on conspiracy theories, and the truth is probably somewhere in between. Indeed, planned obsolescence has been around for quite some time; but I’m not completely sure that’s what’s causing this. What I’m saying is: I can’t tell for sure if this is done on purpose or not. If it is, this is a major deliberate cause of e-waste. Either way, this needs to be fixed – both on micro and macro levels. Here’s what happens, from a consumer standpoint: You buy a brand new, brand-name laptop and use it carefully for about 3 years. Some bits and pieces fall off. A keyboard-key disappears in the vacuum. The warranty expires. After a while, it won’t always charge when you plug in the power. Sometimes you have to “wiggle” the plug a little. After a few months more, it completely stops charging. With no other source of power, you discard it as broken. “It’s probably too expensive to have it repaired anyway. And I wanted a new one as well.”, you tell yourself as you walk to the store. A few years back, the same happened to your MP3-player, but that time, the sound got all glitchy. For most people, this is fine. The product got old, had its defects and then died a simple and painful death in some shoebox. The above is a close-up of the motherboard (PCB) of the computer near the power connector (“barrel”). Note that the whole picture is about 4cm across. 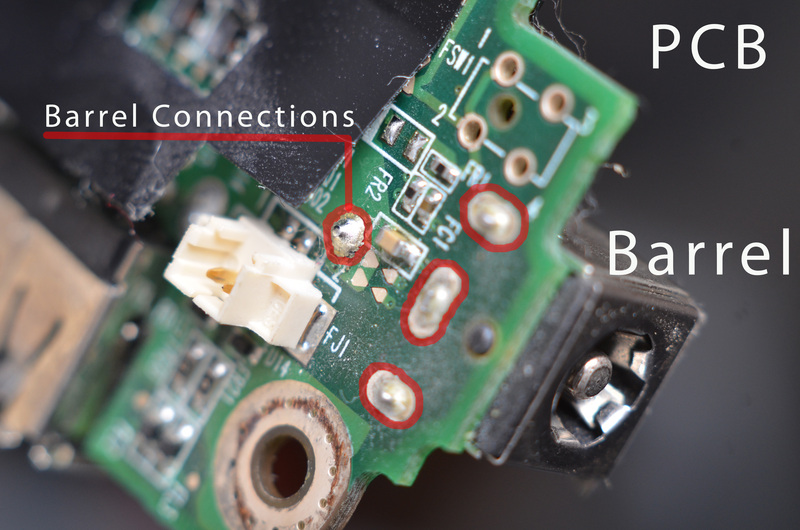 There are 4 connections from the barrel power receptacle to the PCB, all of which are solder connections. Three of them are on the edge of the PCB. One is further from the edge. This is the connection that actually transfers the power that the machine runs on and charges itself with. The plug that went into the barrel is about 7cm long. The three solder connections on the edge of the PCB, in this example, function as a sort of hinge when force or momentum is applied to the barrel connector. Nothing in the construction of the enclosure helped relieve this force. With the distance of the “far” solder joint to the “hinge” being quite small, the arm of the momentum applied by the plug (7cm) means the force is amplified about 10x. 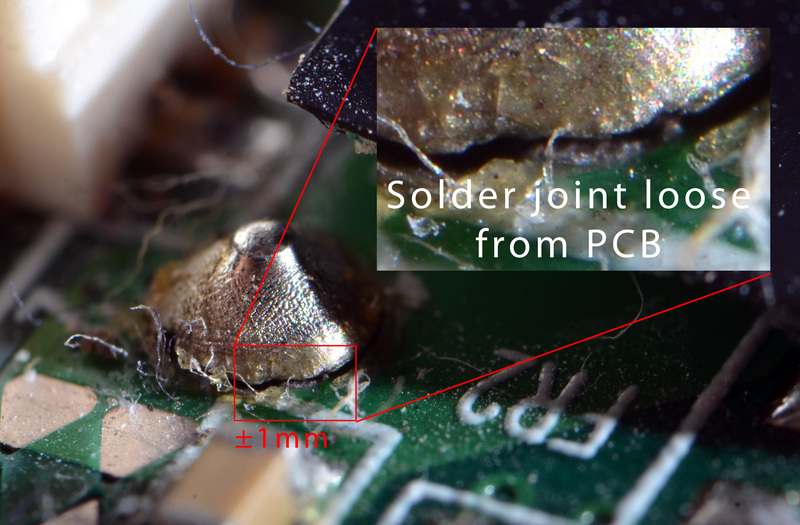 Solder (a mixture of Tin and Lead and/or Copper) is quite brittle. You can probably guess what happens next. 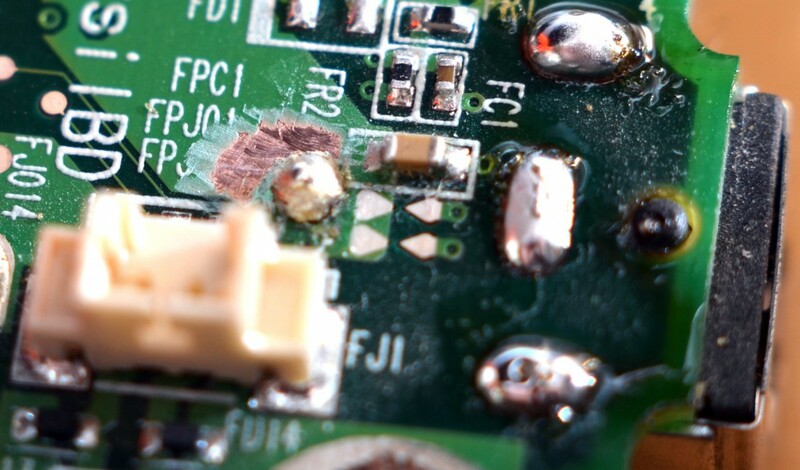 The above is an extreme close-up of the solder joint in question. You can clearly see a gap between the solder (silvery) and the copper of the PCB (light green).The gap is tiny, but big enough to make the whole machine essentially worthless. With this fix, the laptop has now been in use again for about 3 months without problems. I hope this blog post can function as a guide for people with the same or similar problems. 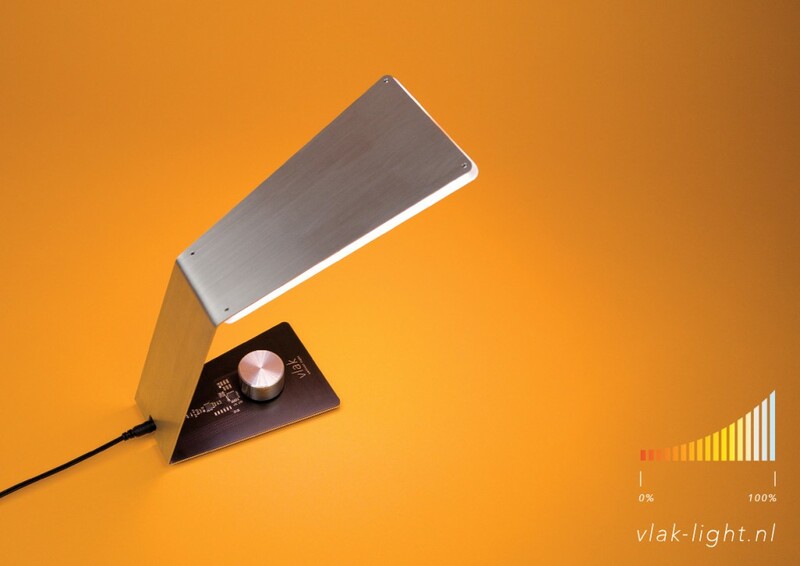 I also hope it can serve as a helpful critique of the industrial design of contemporary consumer electronics. These problems are easily avoided by properly designing these critical components of the gadgets that we use every day. A lot of environmental problems can be solved if the longevity of our electronics can be extended with these simple fixes. Again: Why should something as technologically complex as a laptop PC fail on something as simple as a power plug? I don’t think you would. I think you could do something else: educate people on how to use the soldering iron! what you describe is eternally aggravating. part of the problem is that engineers who design this stuff don’t themselves use the things. sitting at a CRT drafting board somewhere they make the drawings and send it off. done. and god forbid they change anything that increases cost or manufacturing processes. my old girlfriend worked at a kitchen gadgets company. she had a problem with one of the devices, and since she worked there, she talked to the actual owner/designer of the products. when told about the problem, he said “really? well you know, i’ve never actually used one of those, i just design them” so-o-o modern. I’ve had the same response from senior designers while working at a brand name consumer electronics multinational… They’d spend a morning brainstorming new music gadgets and then go back to their drawing boards in the afternoon and listen to music with the product of a competitor. Gregor: You adressed a good point. Also the “non exchangeable battery issue” in new tablet pc and smartphones are a bad development (see [2, 3]). I have linked and addressed your issue in my German article in . Günther, thanks for your backlink and comment. I have read , but since “mein Deutsch ist nicht so gut”, I will read the other ones in full later. Non-replaceable batteries are another big problem indeed, but at least a lot of products can still be quite easily revived with a new battery. 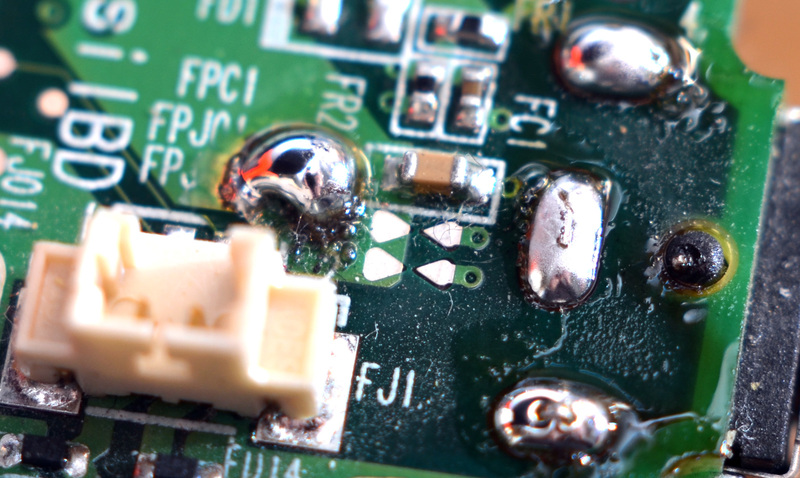 Not as easy as we’d like, but at least it’s not as hard as bypass-soldering a micro-USB connector. One thing you did not mention was the RoHS regulations that banned lead from electrical products in Europe. This had the effect of degrading solder and increasing the likelihood of ‘tin whiskers’, which are tiny filaments of elemental tin that grow out of deposited solder. These whiskers can cause electrical shorts, and equipment failures. Interestingly, NASA and other organisations that require reliable electrical equipment have been stockpiling the older lead solder to prevent such problems occurring where the effect could be quite dangerous. Yes, I recently read about that. This article wasn’t meant as a complete guide to problems within the electronics market, but it’s certainly an interesting point. The RoHS/tin-whiskers-problem a good example of intelligent and well-meaning people pushing for legislation that is meant to help solve a problem, but creating another (or several) along the way. I’d like to compare it to the plastic industry pushing bio-plastics as a “green” alternative to oil-based thermoplastics like PC, ABS and PA (Nylon). All fine and dandy, but if (e.g.) a mobile phone with a PLA (a bioplastic) enclosure fails earlier because of the quality that enclosure (bioplastics tend to have a shorter life than their “engineering plastics” counterparts in several metrics such as UV-resistance, tensile strength, impact strength), a lot of other parts (not to mention the energy and raw materials used for the production of them) are “lost” as well. You’re throwing the baby out with the bath water. A completely different story, but linked to the “hoarding of lead solder”: IEEE’s Spectrum recently wrote a lengthy (and very interesting!) article on how the electronics industry is confronted more and more with the problem of discontinued parts. This is especially problematic if you’re in charge of keeping long-service-life systems working (such as a power station). It is remarkable that a lot of modern products dies in one or two years, while my parents use a 30-20 years old amplifier, radio and CD player! I hear about it already for several years around me, especially in mobile phones. Maybe it is due to miniaturization and optimization in the production rate. But It’s a nasty world where money rules, at the expense of our environment… It is worth a research!